Archangels and Ascended Masters is a thoroughly researched book in a lively encyclopedia format, listing 77 divinities from Greek, Roman, Egyptian, Asian, Babylonian, Tibetan, Buddhist, Celtic, Theosophical, New Age, Catholic, Cabalistic, Jewish, and Christian roots. Doreen carefully studied and wrote about the history of each deity, what role they serve today, how they can help us with specific life problems, and how to call upon each one. 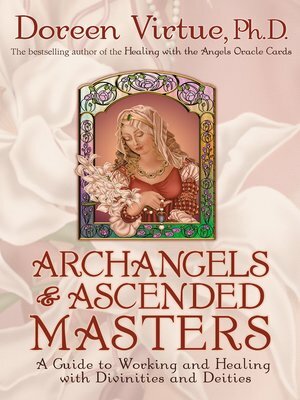 Doreen spent time in communication with each divinity to ensure that the being was reachable, and to discover the essence of his or her personality and current dealings with the world—and within these pages, she includes a channeled message or impression from each of the ascended masters and archangels. Many of her channelings were conducted at power points throughout the world, such as Stonehenge in England; the Irish coast; Kona, Hawaii; and the New Zealand rain forest. A comprehensive chart lists a number of life situations, such as Addictions, Finding a Soulmate, Emergency Money, Healing Physical Illness, and various personal and family concerns. Beneath each topic is the list of whom to call upon when dealing with that particular challenge. Doreen also includes prayers to call upon multiple divinities for specific issues such as "increased clairvoyance" and "resolving conflict."